“Art never lies,” mused an instructor-mentor. Art has the capability to reveal our inner most truths. Whether we are consciously aware of them or not, the expression of the human experience through art increases the knowledge of self and ability to be authentic. Perspective and Perception – A person’s perspective on their environment coupled with their perception of self often dictates their emotional experience. Art reveals these emotions through a body and mind experience. Connecting the body and mind helps to develop a mindful state of the moment. Controlling Feelings and Impulses – Art expression helps to modulate a person’s emotional response. A safe space to emote through visuals can increase confidence and your ability to know you can do it. Behavior change – In recent studies by Haeyan, van Hooren and Hutchemaekers (2015), individuals participating in art therapy report a greater sense of control in their behavior towards self and others. 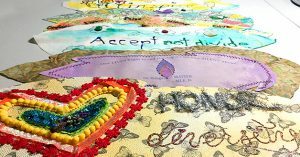 It’s not an exact science but many art expressive therapists believe a self-directed therapy through art creates a practice arena or palette to problem solve future conflicts. New Directions Counseling Services’ art therapist, Lauren Cormier, provided these bullet points regarding art therapy. Creative expression – art, music and dance – has always been an instinctive part of human existence. It is a powerful way to communicate. 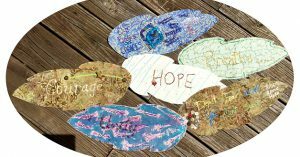 Creative-expressive therapies, such as art psychotherapy, capitalize on this as both means and end to self-exploration, self-awareness, and catharsis for growth and change. 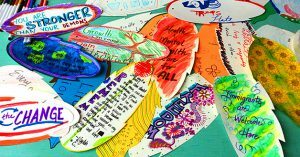 The project asked individuals to contribute feathers – symbolizing freedoms and the ability to rise above hate & intolerance – depicting ideas & values that are integral to the individual’s life in the USA and that they want to be valued by the nation. NDCS staff had the opportunity to participate through art therapist, Lauren Cormier, MAAT, LPC. Lauren remarked on the project and art therapy as well.